Uveitis Information Group - What is Uveitis? The term uveitis covers a range of conditions which affect the inside of the eye. Uveitis is inflammation of the uvea. 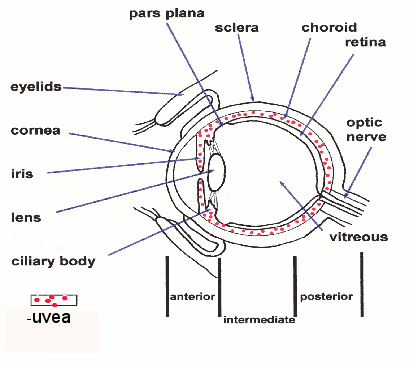 The uvea is the part of the eye, consisting collectively of the iris, the choroid, and the ciliary body (see diagram below). The iris is the circular, colored centre of the front of the eye that surrounds the pupil. The choroid is a thin layer of the eye that is situated between the sclera (the white of the eye) and the retina (the nerve layer that lines the back of the eye, senses light, and creates impulses that travel through the optic nerve to the brain). The ciliary body is the tissue that connects the iris with the choroid and includes a group of muscles which help to change the shape of the lens, in order to see different distances. The word "uvea" comes from the Latin word "uva" for grape. If you remove the stem from a grape, the hole left looks like the pupil and the grape looks like the eyeball. 'Itis' means inflammation. Therefore, uveitis means inflammation of any part of the uvea (iris, choroid or ciliary body). Uveitis can be controlled with early treatment, but if left untreated may cause serious problems and sight loss. There are different types of uveitis and there can be many different causes. It is very important to know which type you have. Acute: the inflammation comes in short episodes of up to about 6 weeks, but it may recur from time to time. Chronic: the inflammation may persist for months or years possibly flaring up at times. It may have to be controlled by taking medication for long periods. Why is it important to know what type of uveitis I have? The symptoms, causes and reatment may be completely different depending on what type you have. The immune system's job in our body is to detect and attack foreign bodies such as bacteria or viruses. To do this it needs to be able to tell 'self' and 'foreign' apart. In autoimmune disease this process goes wrong and a part of our body (self) is mistaken as foreign. That part of the body is attacked by its own immune system. The result is inflammation. A variety of infections may cause uveitis. This is not a very common cause of uveitis. It is very important to establish whether the uveitis is infectious or not, as the treatment will be very different. If you receive the wrong treatment it may not improve your condition. In fact, it may make your condition worse. This includes some form of eye injury and / or eye surgery. This means no specific cause or association with other medical conditions can be found, Up to 50% of uveitis cases are in this group but are still likely to be autoimmune in nature. Some patients will have a medical condition which is known to be linked with uveitis. eg: sarcoidosis, crohn's disease, ulcerative colitis, juvenile forms of rheumatoid arthritis and ankylosing spondylitis. With anterior uveitis, some people will only ever get a single episode of anterior uveitis. For many, the uveitis will recur in the future or be chronic and require treatment over a longer period of time. With intermediate or posterior uveitis, it is more likely that the condition will last for a longer time or will be chronic. The eye contains delicate structures and is easily damaged. Inflammation must NOT be allowed to remain for any length of time because it may damage your vision. If you experience or suspect a recurrence of any of the symptoms above, you should report straight away to the eye clinic. Ensure that you receive a follow up appointment and ensure you keep seeing your specialist until you and your specialist are absolutely sure there is no more inflammation. For some people, even when there is no inflammation present, they will need to continue seeing specialists, particularly if the uveitis is deemed to be autoimmune. To diagnose the exact type of uveitis and to find its possible cause, different methods should be used. Some questions about any past medical problems can suggest possible causes or associations with other medical conditions at an early stage. First, your vision should be measured, with any glasses you wear. The eye chart that we know from the Optometrist is used. This measures visual acuity. Your near, or reading, vision should also be checked. It is a good idea to get the nurse who measures these to write the results down for you. Anyone you contact about your eye problem (e.g. patient group, employer) will then know how your vision has been affected. You should then have drops placed in your eyes to dilate the pupil. This is important so that the back of the eye can be examined for signs of inflammation or complications. The eyes will be examined with a 'slit lamp', a type of microscope found in Eye Clinics and at Optometrists. Depending on the type of uveitis found or if certain complications are suspected other more specialised tests such as a fluorescein angiogram or an OCT (Optical Coherence Tomography which is a useful and non invasive investigation), may be used. As a result of the questions asked and the eye examination, a variety of medical tests may be carried out to follow up any 'leads'. This may include blood tests and X-rays. Some of the medical conditions associated with uveitis include: sarcoidosis, crohn's disease, ulcerative colitis, ankylosing spondylitis and juvenile forms of arthritis. Severity Is the uveitis thought to be sight threatening or non sight threatening? It is a good idea to ask which of these applies to you. The treatment of the different types are summarised on the next page. Dilating drop, this will dilate the pupil, is given to relieve pain and also prevent the iris sticking to the lens (see complications). Steroid eye drops to control the inflammation. These must usually be given very frequently at first and for long enough to completely control the inflammation. If the uveitis is more severe injections around the eye or steroid tablets may be necessary. Hot compresses may be very useful to relieve symptoms and to treat synechiae (iris sticking to lens). You must take all the drops and continue to take them for the whole course (usually at least 6 weeks) and not stop them if the eyes feel better. NEVER stop taking any form of steroids suddenly unless told by your doctors. This can be dangerous. Make sure you are followed up to check things are all clear after an attack. Make sure you are given information about the treatment you are prescribed, including name of drug, exactly how it should be taken, how often it should be taken and how it should be stored. Treatment depends on the different forms of posterior uveitis and severity. Eye drops cannot reach the back of the eye so tablets and sometimes injections must be used. The main drug used is a steroid, (a corticosteroid, not related to those misused by athletes), called prednisolone. Taking tablets is called a systemic treatment. Steroid treatment starts with high doses (e.g. 80mg prednisolone) which are tapered down when the uveitis is under control. If the steroids alone cannot control the uveitis or if the steroid dose cannot be reduced down to below about 7.5mg within a reasonable time, without the inflammation 'flaring up', then a 'second line' immunosuppressant drug may be introduced. These 'second line' drugs are used to reduce (or 'spare') the amount of steroids used and / or to control the uveitis if this cannot be achieved by short term steroid use. There are a number of 'immunosuppressant' drugs which can be used and these should be discussed with your eye specialist to understand what is involved. They can be very useful to control difficult cases and to decrease a patient's dependence on high doses of steroids. All treatments may have some side effects. The Uveitis Information Group has information on the different drugs and methods of treatment and their side effects. Please contact us if you need some help with this. Some other eye problems may arise in patients with uveitis. These may be caused by the effects of the inflammation inside the eye, but also can result from steroid treatment to control the inflammation. It must be remembered that using sufficient steroids to control the uveitis will generally give a better outcome than using too little steroid and not controlling the inflammation. Macula oedema Fluid which builds up in the back of the eye and can be sight threatening. It is very important that these complications are picked up very early on as they can be more sight threatening than the underlying uveitis. Complications can only be picked up by thorough examination which should always include the back of the eye. This guide is aimed to summarise all the main aspects of uveitis and to alert you to the most important things to understand about uveitis. You can find more detailed information on the website or contact the UIG for printed information. Please get in touch if you have any questions or concerns. This factsheet was written by Phil Hibbert B.D.S. L.D.S. R.C.S., patient. It has been verified by a panel of experts which include uveitis specialists.